Alright, it's election day tomorrow. We all know why we're here. Let's do some number crunching. This redistribution put four Labor-held seats (Colton, Elder, Mawson and Newland) into the nominally Liberal range. Seats italicised are those that will deserve special consideration later on, either because the incumbent does not match the nominal 2-party margin (the four previous seats and those held by independents) or because they are on The Poll Bludger's list of possible wins for SA-Best. Two by-elections in SA (in the seats of Fisher and Davenport) also mean that applying the swing from 2014 (rather than the by-election year) may be flawed. Davenport already deserves special consideration as a possible SA-Best win; Fisher is no longer a seat. So let's just apply the predicted swing across the board to get us started. The interesting thing about this election is that, compared to 2014, both Labor and Liberal have reduced their primary vote (down 5.8 and 12.8 percentage points respectively, according to Newspoll). This is largely due to the rise of SA-Best--indeed polls have stopped publishing 2 party preferred data. Adelaide, Black, Chaffey, Colton, Davenport, Elder, Finniss, Florey, Frome, Gibson, Giles, Hammond, Hartley, Heysen, Kavel, Mawson, Morialta, Morphett, Mt Gambier, Narungga, Newland, Stuart and Waite. Holy Pebble-counters, that's a lot! Florey: Florey is a safe ALP seat on the numbers and by history. The current incumbent, Frances Bedford, was an ALP member until she became an independent last year. The biggest challenge to an independent is getting enough name recognition to beat the major parties, and sometimes being an incumbent is not enough. In Bedford's case, this hurdle appears to have been mounted; a poll in 2017 had her primary vote ahead of the ALP, and I suspect this has only grown with the exodus of support from the major parties. Frome: In 2014, Geoff Brock's primary vote almost out-polled Liberals and Labor combined; again, the hurdle of recognition has been beaten, although there may be some backlash against the candidate in the conservative seat for working with Labor. Mt Gambier: Despite controversy surrounding the financial actions of former-Liberal, independent incumbent Troy Bell, there was polling about a month back showing he would easily win the seat and I don't expect this to have changed. This seat was also listed as a potential Xenophon win, but this has been accounted for in the polls. The federal election was held in July 2016. At that time state polling included SAB support at 16pp. Federal results in these seats were over 23%. Since then, SAB primary vote statewide has improved by 5, or 31%. 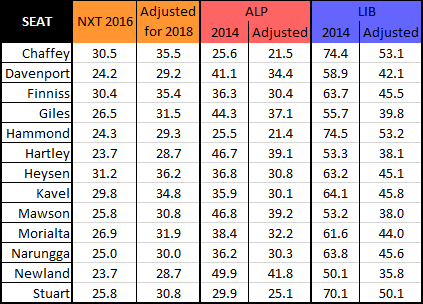 To be conservative, we will add a flat 5pp to the federal results (by which The Poll Bludger identified these as hot SAB seats) and compare that to the pendulum (ignoring the Davenport by-election) adjusted by the recent polling for the rise of SA-Best (ALP x83.8%; LIB x71.4%). The test here is to see whether SA-Best can beat at least one major party so it can collect the flow-on preferences. The answer is yes in the case of Chaffey, Finniss, Hammond, Heysen and Kavel (parts of federal Mayo, which elected Xenophon's only lower house candidate in 2016) and Stuart. I will tentatively give these to SA-Best and the others to the major parties. Interestingly, this means Xenophon's own seat of Hartley is given to the LIBs. Adelaide, Black, Colton and Elder. Just quickly: Adelaide has a strong ALP history; Paul Caica has held Colton since 2002, when Labor first got in, but his primary vote margin over the Libs was 0.1% and 3% 2pp--with the dropping of Labor's popularity and a tough redistribution I'm calling this LIB; Elder has been ALP since 1997, but the redistribution was rough--nominally LIB; Black used to be Mitchell which was all over the place historically so dart-at-a-dartboard this is LIB too. ALP 19; LIB 18; SA-Best 7; IND 3. That's by the numbers, at least. My gut says SA-Best might get 3 seats at most, and the others go to the Libs giving them 22. I also feel the Indpendents and Xenophon will back the Libs to form minority government either way.